Use the form below to contact tour Vietnam tour package 17 days directly. Arrive to Tan Son Nhat airport. Meeting your tour guide and driver. Pick up and transfer to your hotel. Overnight at your proposed hotel in Ho Chi Minh. Breakfast at the hotel. At 8.30am, from your hotel, riding on a rickshaw for an adventure winding through the sights, sounds & smells of this historic metropolis – the ideal way to experience the city. Stopping at the 30 – 40 park, taking a walking tour to visit the Reunification Palace, which was the former residence of the President of South Vietnam until end of the war in April 1975, and some French colonial structures including Notre Dame Cathedral, the Old Central Post Office. Tour of Chinatown and Thien Hau pagodas. After seeing the War Remnants Museum, we end the city tour with Ben Thanh market where anything and everything is for sale. Breakfast at the hotel. Visit the Cu Chi Tunnels, an underground network of tunnels constructed by Vietnamese fighters during the struggle for independence. The tunnels contained hospitals, accommodation, etc. and were used as a military base for the Vietcong during the American war. Having lunch at Ho Chi Minh village where you can do something as a famer. Return to Ho Chi Minh and free for shopping. 12h00pm boarding Le Cochinchine or Mekong Emotion boat (according to our boat schedule each day), up for cruise to continue to Can Tho via Cho Lach and Tra On. 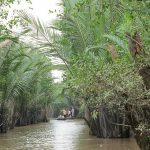 Up to river tide, disembark and make a pleasant walking or biking on the footpaths of the countryside to discover tropical fruit orchards and the local people’s activities, especially somes orchards (orange grove) with its famer. Dinner and nite on board in Tra On. Arrive Can Tho, a small boat will take you explore the Cai Rang market one of the most bustling floating markets inMekong Delta with hundreds of small boats barging and jostling for space as owners attempt to sell their goods. And through the palm-shaded creek to see local houses and green orchards. 10h00 disembark. Transfer to a local restaurant for lunch. 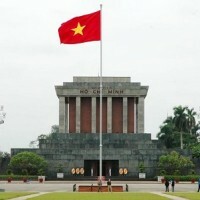 Then transfer to the airport for boarding the flight VN1202 to Ha Noi (16.30 – 18.40). Pick up and transfer to your hotel in Ha Noi. Breakfast at the hotel. At 8.30am, pick up at your hotel for visit the Ho Chi Minh Complex, containing the Ho Chi Minh Mausoleum, the Presidential Palace, Ho Chi Minh’s house on stilts and the One Pillar Pagoda, continue to the Temple of Literature, Vietnam’s first university. You will also visit the famous prison that American POWs sarcastically dubbed the “Hanoi Hilton” during the Vietnam War. Take a relaxing walk along Thanh Nien street next to the famous West Lake. 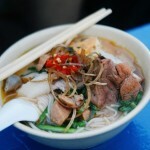 Visit Dong Xuan market and enjoy traditional food Cha Ca La Vong a Ha Noi specialty. Wandering around 36 streets in the Old Quarter. You will have many chance to see local product handmade as well as doing shopping. Breakfast at the hotel. At 8.30 am, depart for Ha Long by bus. Arrive at Paloma office,Halong City. Tranfer by tender to the Paloma Cruise – enjoy welcome drink. Receive cruise briefing and check in to cabins and begin cruise. During the morning our chef and crew prepare a special BBQ lunch on the private beach (depends on the weather). After lunch we discover Ho Ba Ham Islet in Lan Ha Bay which borders the Gulf of Tonkin. 16:00 Back on board The Paloma, take time to refresh and relax. Return to Paloma cruise. Check out the cabin.Western menu is served onboard. The vessel cruises leisurely back to harbor. Return to Ha Noi by shuttle bus. Transfer to the train station for the night train to Lao Cai (21.50pm – 06.15am). Meeting your local tour guide and driver upon arrival. Drive to BacHa market. The beginning of the day on which you visit a big market filled with many different hill-tribe peoples. This is the most colourful market in North Vietnam. At the market, you have chance to enjoy BacHa people’s simple but unique kinds of food with special wines made from rice, cassavas, corn and different sorts of fruits such as plumps, apples, peaches… talking to the minorities through the guide’s interpretation. Leave the market for the H’mong King’s house (King Hoang A Tuong) built by the French colonists and the Chinese in 1920. Return the town for lunch. In the afternoon, spend time visiting BanPho village. Say good bye to BacHa and get back to Sapa. On the way back, drop in to see the Vietnamese and Chinese Harbour Mouth in LaoCai. Overnight at your proposed hotel in Sapa. Breakfast at the hotel. At 8.00am, leave Sapa by jeep to visit an H’mong village nestling in a beautiful valley and a hydroelectric power station built by the French. Follow a small path to visit 2 other villages of the H’mong and the Dzay people (LaoChai and TaVan). Return to Sapa. Leisure until 18.00, transfer to Lao Cai train station for boarding the Express train to Hanoi (21.00pm – 05.30am). Arrival to the train station around 05.30 am, pick up and transfer to the airport for boarding the flight VN1541 to Hue (08.20am – 09.30am). Meeting your tour guide and driver on arrival. Start a your sightseeing by take a morning cruise on the Perfume River to visit the royal tomb of Emperor Tu Duc, Thien Mu pagoda and the mausoleum of Emperor Minh Mang, in a setting of gardens and lakes. In the afternoon, visit Dong Ba market, the Imperial Citadel from where the Nguyen Dynasty ruled between1802 and 1945, and the ruins of the Purple Forbidden City. 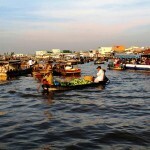 At 17.00, Transfer to Hoi An town. Breakfast & Dinner on guest’s account. Breakfast at the hotel. Make a walking trip to visit Hoi An ancient town. Wander around Hoi An you have an enjoyment of old streets, houses…visit Tan Ky house, Japanese Bridge, Phuc Kien Hall, Sa Huynh Museum, local market. You can also have time to enjoy traditional music performance in old house. Once more special of Hoi An ancient town is spending time to go shopping at silk shops, lattern shops for experience of handicarft villages and make tailor with reasonable price. In the afternoon, leave for visiting My Son Hollyland – the ruins of Cham people and was an imperial city during Cham dynasty. Here you have more chance to learn about of architecture of Cham people. You can see a large complex of religious relics that comprises more than 65 architectural works. In 1999, UNESCO labeled the Cham architecture in My Son as a World Cultural Heritage Site. Having chance to enjoy the traditional music performance of Cham girls. Back your hotel. Dinner on guest’s account. Breakfast at the hotel. Leisure in the morning until noon, pick up and transfer to the airport for boarding the flight VN117 to Ho Chi Minh city (14.20– 15.35). After having breakfast at the hotel, transfer to the international airport. A/c private transport for pick up, transfer and sightseeing as per program. 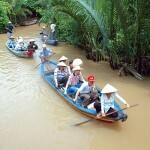 Thank you for visiting our Vietnam tour package 17 days. We are looking forward to serving you.